Are you wearing the same clothes day in day out? Do you keep buying the same items over and over? Is it filled with clothes you don’t feel good in or never wear? Let Closette take you shopping. Revamp your wardrobe and your look with a one-on-one shopping experience. I work within your needs, style and budget to either fill in the gaps or start fresh. Together, we can develop a plan for shopping each season, investing in the ‘bones’ - classic pieces you can wear forever. 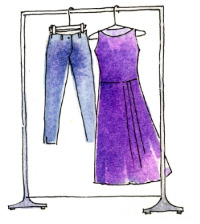 Learn how to create the foundation for a stylish and workable wardrobe. And purchase items you’ll wear time and time again. Personal Shopping is available for Men & Women. Bookings may be made individually, for couples or for groups.